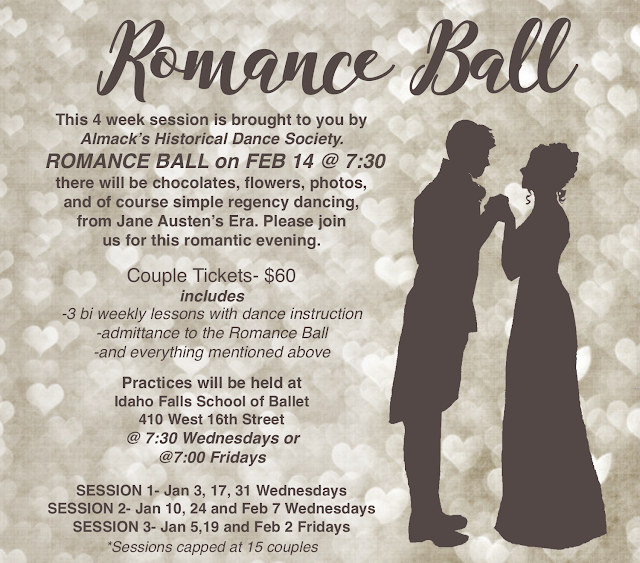 We have been invited back to the Idaho Falls Public Library again this year to do the 2nd annual JANE AUSTEN BALL! It is exciting to remember that this is where our group started just last year! People are welcome to come to any of our three practices and/or our ball. Come to all of them or one of them. There will be instruction each night. with new dances. 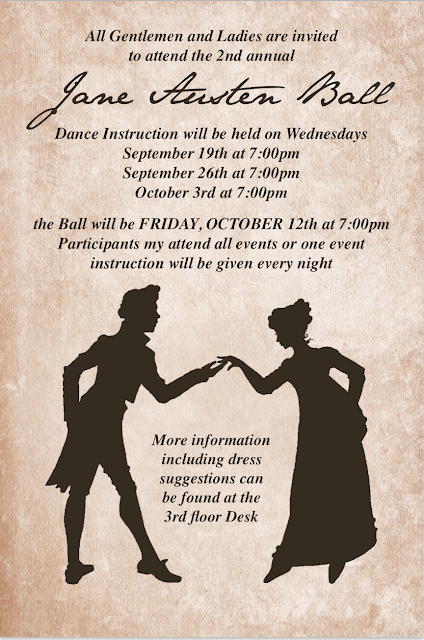 Here is a youtube playlist of dances we will be doing. We do variations of them not these exact dances. For example on Sir Roger De Coverley we do not weave between the couples, for Upon a Summers Day we do not do different variations each time we just repeat the last variation 3 times. I also took the liberty of removing one step from Mr. Beveridges Maggot so that the dance could be executed as a group. We also do Ships cook differently. All these changes I made so that the dances can be more easily learned in a small amount of time, and to make them easier so that every person not just trained dancers can join us with ease. I hope you come, we have a delightsome time together and would enjoy your company!